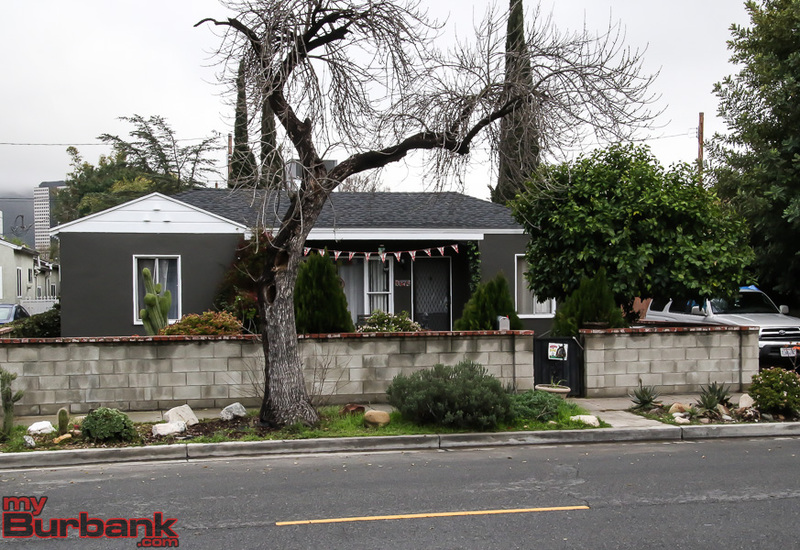 Burbank police were called to the 1800 block of N. Kenwood around 9:25 am Tuesday for a report of a possible burglary with the occupants still inside the residence. Arriving on scene, officers were able to stop a vehicle and detained the driver after finding items of evidence inside the car with two additional suspects still outstanding. A perimeter was quickly established in the area to contain the men. Police searched the area house by house led by the Burbank Police K-9’s with assistance from both Glendale and San Fernando who also sent their K-9 units in the massive search. There was also support from above with police helicopters. Police were finally able to find the men after about four hours of searching with both being found underneath a house on Maple Street. Both men were then taken into custody with further incident. The Los Angeles County District Attorney’s Office will review the case and recommend charges. 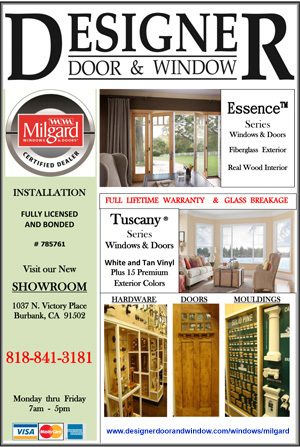 This entry was posted in News, Police and tagged Burbank Police Department, K-9, kenwood, residential burglary on March 28, 2019 by Craig Sherwood. 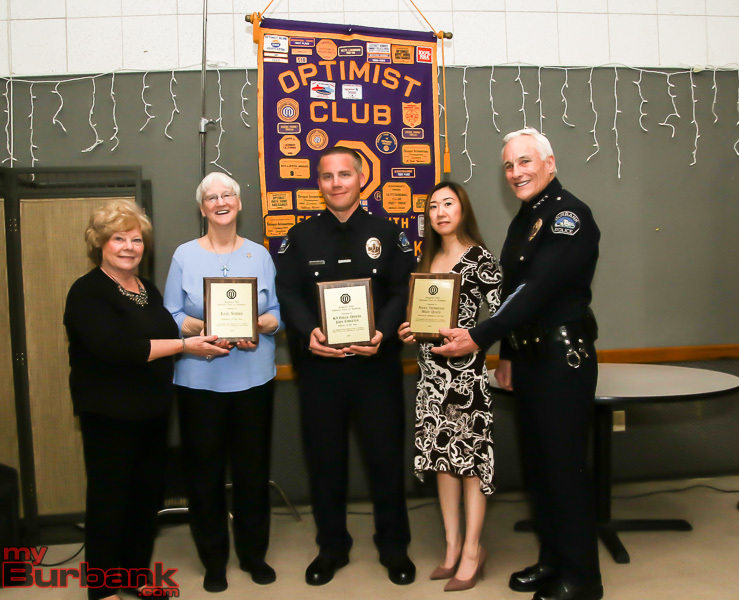 On Thursday evening, the Magnolia Park Optimist Club recognized three members of the Burbank Police Department family for their achievements as part of the Optimist International Respect for the Law program. Citizen Volunteer Kaye Norris, Police Technician Helen Quach, and K-9 Officer John Embleton were all honored in a ceremony with individual achievements highlighted by Burbank Police Chief Scott LaChasse. 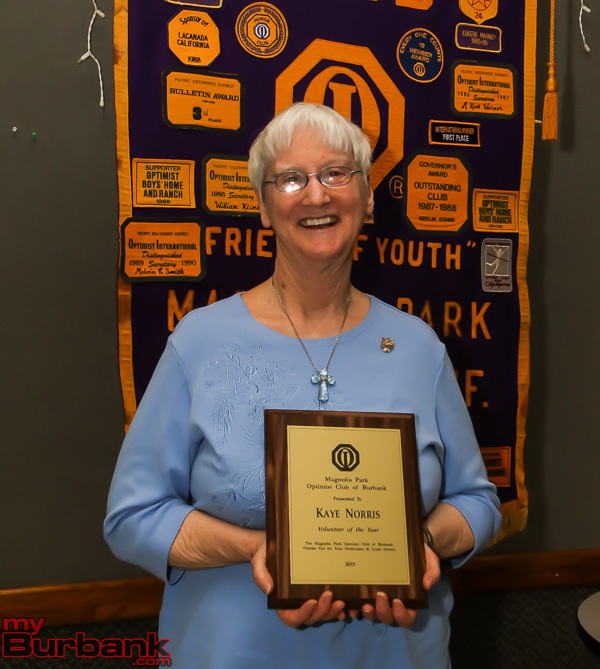 Kaye Norris is the 2018 “Volunteer of the Year.” Kaye retired from 35-year career as a teacher in LAUSD, and after a short time taking a break determined “if this is retirement, I don’t think I like it.” Since then she has found her call through volunteering in activities with her church, and the Burbank Temporary Assistance Center. However, Kaye also had always been interested in police work, and decided to join the Burbank Police Community Academy course, and fell in love with the environment. 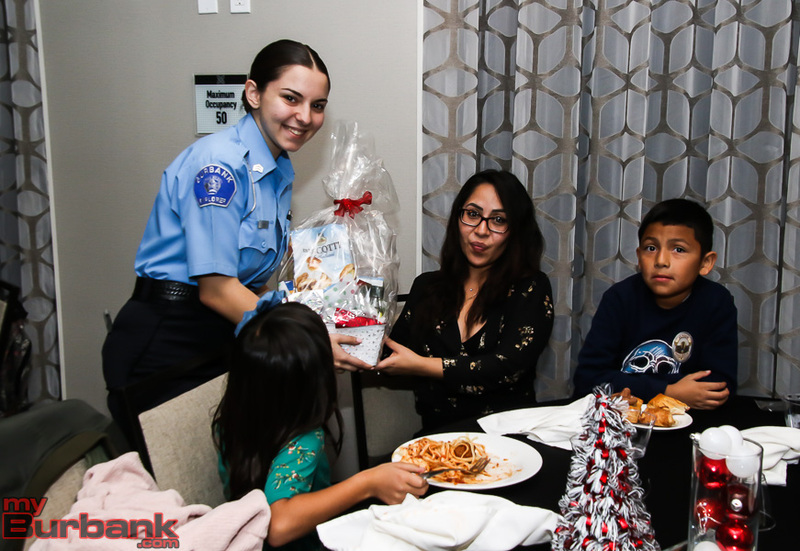 Since then she has spent up to 515 hours and 8 months a year as a Burbank Police Department Volunteer, currently working with the Traffic Bureau. According to Chief LaChasse, Kaye is always open to learning new skills and working wherever needed within the Department. 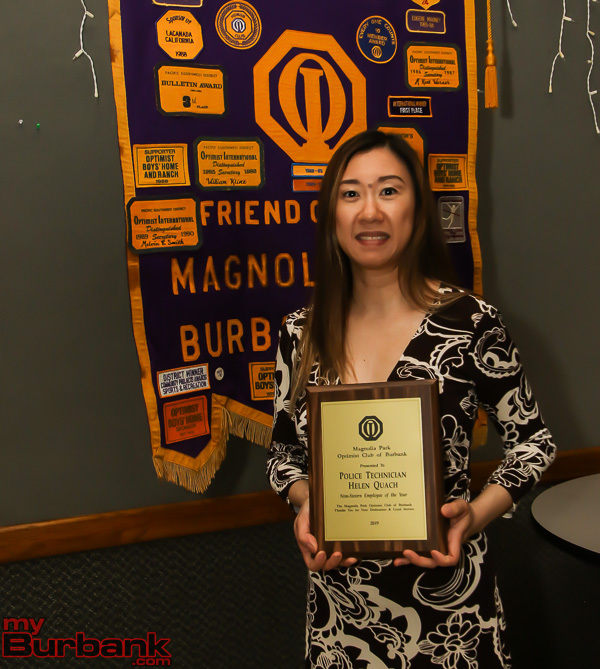 Helen Quach is the 2018 “Non-Sworn Employee of the Year.” Working with the Burbank Police since 2009, Helen currently works in the Department’s Warrant Office, responsible for maintaining entries supporting restraining orders, and supporting the Subpoena Control Office. She also assisted in the implementation of the Department to a new web-based subpoena system managed by the LA County District Attorney’s Office. K-9 Officer John Embleton is the 2018 “Officer of the Year.” Officer Embleton joined the Burbank Police Department in 2005 following service with the LA County Sheriff Department and has worked K-9 since 2010. Officer Embleton and his K-9 partner Bram serve the city and surrounding communities, responding to emergency calls, incidents, weapons, and narcotics investigations, often identifying potential threats simply through experience and awareness. One such incident took place at the end of October 2018. Officer Embleton was en route to an early morning K-9 training exercise and came upon a multi-vehicle accident on Interstate 210 near Sylmar. Stopping to render assistance, Officer Embleton also “ran” the vehicle plates as is his routine when making a stop. In this case, one of the plates came back as a vehicle belonging to a murder suspect from Sacramento County. The suspect was apprehended, bringing praise to both Officer Embleton and the Burbank Police Department. Being on the front lines of violent criminal apprehensions, Officer Embleton and his partner Bram are often called to assist other local agencies when needed. Bram recently was assisting a call supporting LAPD, and when engaging a violent suspect, was injured, breaking several teeth. Fortunately, Bram is just fine, and is receiving a new set of titanium “choppers” to replace his broken teeth, and will be back on duty soon. The Respect for Law Program began in 1965 with the support of the FBI Director J. Edgar Hoover, and now includes more than 1500 participating Optimist Clubs around the world. 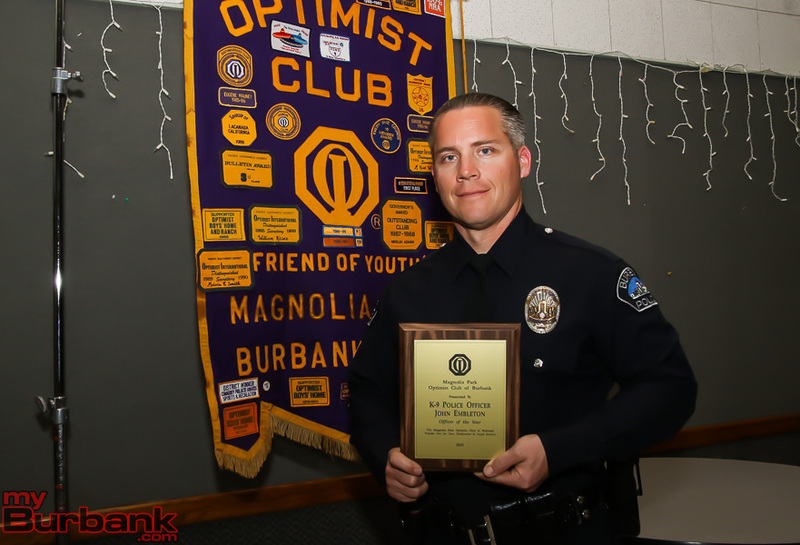 In addition to awards programs honoring police staff, the Optimist Club promotes improved partnerships between police and citizens through programs to introduce youth to community law enforcement officers, lawmakers, law processes, and reinforcing the need for youth to understand and obey the law. 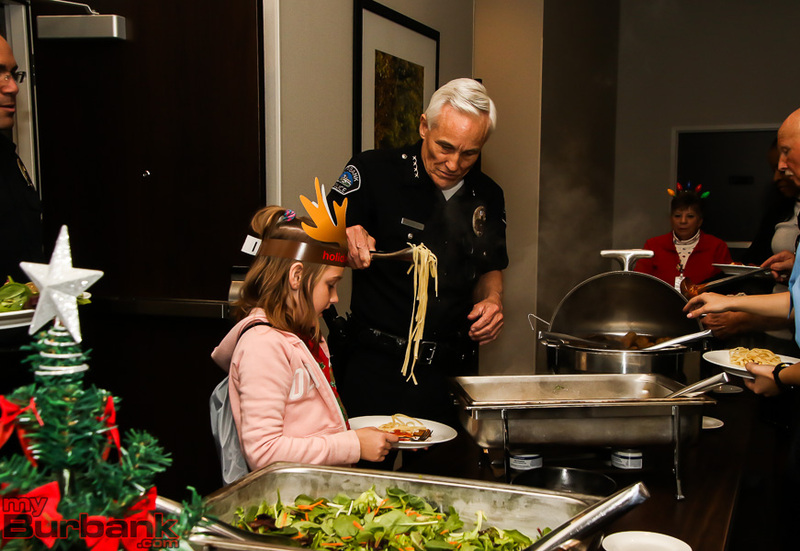 Chief LaChasse noted that Burbank has seen a reduction in crime, with citizens playing an important role in contacting law enforcement when observing activities that have resulted in improved response times and a safer city. Congratulations to all out Burbank Police Honorees, and to the Magnolia Pak Optimist Club for supporting Law Enforcement and the community through their Respect for the Law Program. 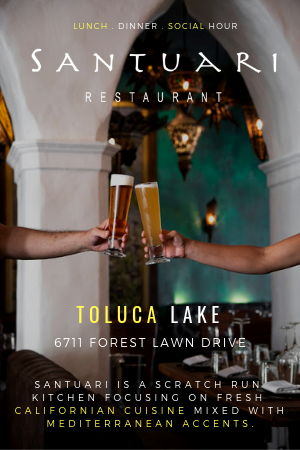 This entry was posted in Featured, Magnolia Park Optimist, News, Organizations, Police and tagged Burbank Police Department, The Magnolia Park Optimist Club on March 4, 2019 by John Savageau. Burbank police have identified the 21 year-old victim of the shooting as Christian Guevara of Burbank. Detectives have confirmed that Guevara was attending a party in the 4000 block of Clark when the shooting occurred on the morning of March 2.There are still no suspects at this time. It is believed that there were up to 50 people at the party during various time and detectives have already interviewed several people and have said to have developed some leads. Police are looking to identify more of the party goers and are looking for the public’s help in identifying the suspect. If you have any information you may call the Burbank Police at 818 238-3000 and remain anonymous. 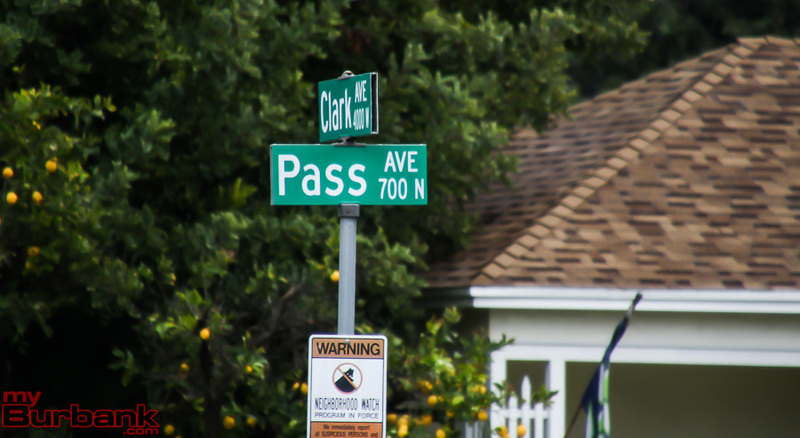 Original Story: Burbank police detectives are investigating a possible homicide that might have occurred during a party in the 4000 block of Clark Avenue Saturday morning, March 2. There are few confirmed details at this point except that a 21-year-old man was dropped off at St. Joseph Medical Center with a gunshot wound and then had to be transported to a trauma center where he later died from his wound. Police were called to St. Joseph’s when alerted by the hospital staff at 2:36 am according to a release sent out by Sgt. 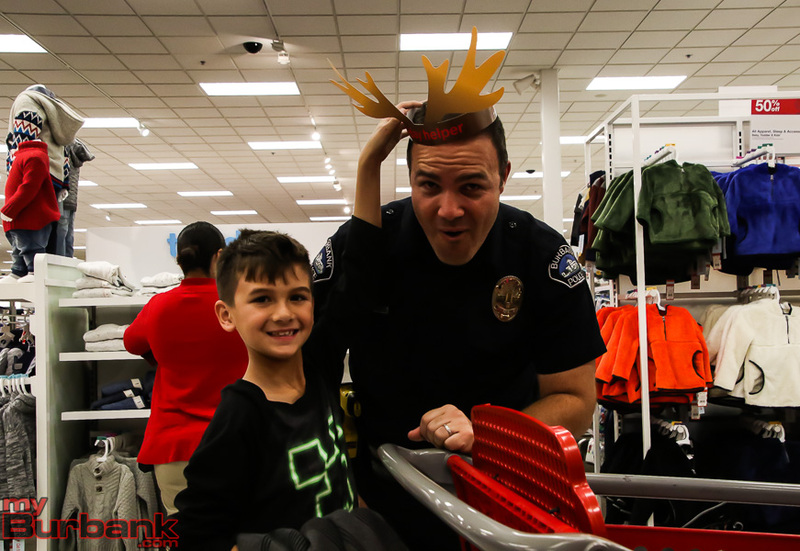 Derek Green of the Burbank Police Department. By the time detectives found out the possible location of the shooting and responded to the home on the 4000 block of Clark Avenue, most of the people from the party had left the scene. Detectives remained at the scene for several hours. Police have not released the name of the victim. 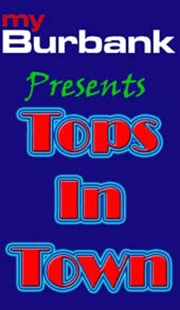 During the night police received no reports of gunfire heard in the area although there were several possible auto burglaries that also occurred in the same area during the night. 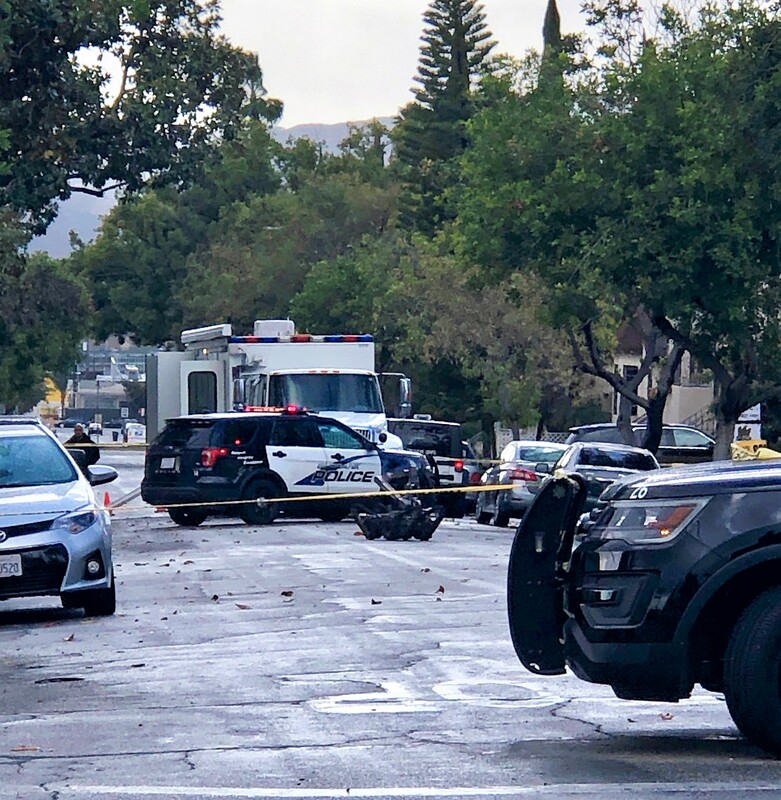 This entry was posted in News, Police and tagged Burbank Police Department, Clark, Shooting on March 3, 2019 by Craig Sherwood. 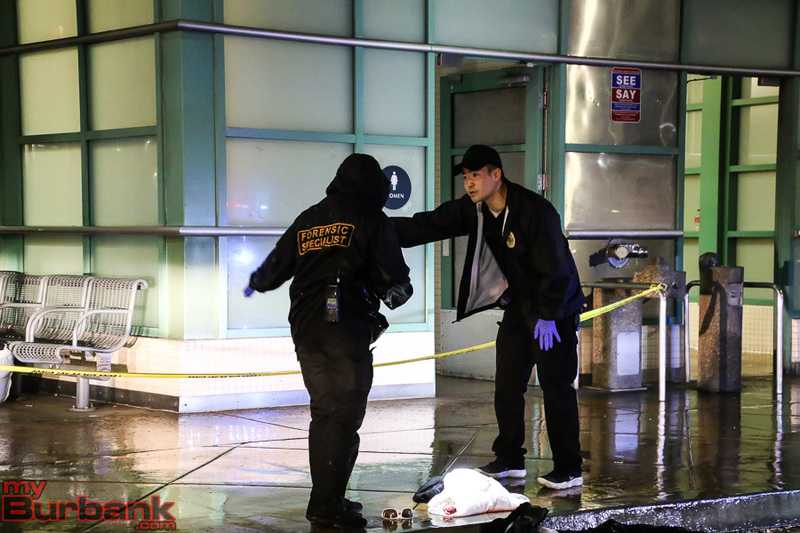 Burbank police received a call around 4:45 pm Tuesday of a man who had been stabbed in the neck near the Burbank Metrolink Station. In an email statement provided by Sgt. Derek Green of the Burbank Police Department, “When police officers arrived, they located an adult male victim with a stab wound to the neck area. The victim was transported to a local hospital for treatment. While no motive for the stabbing is yet known, detectives are actively working the investigation. 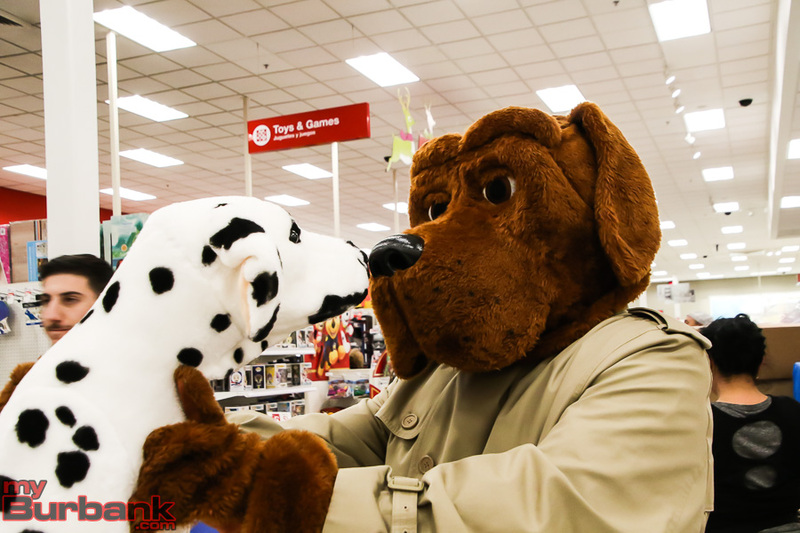 A report from the scene, but not confirmed, said the suspect had taken the man’s wallet. No update on the victim’s condition is available. 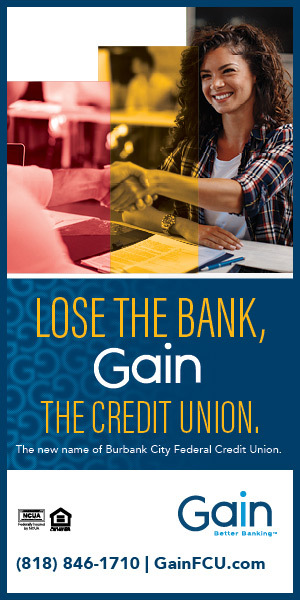 This entry was posted in News, Police and tagged Burbank Police Department, Metrolink, Stabbing on January 16, 2019 by Craig Sherwood. 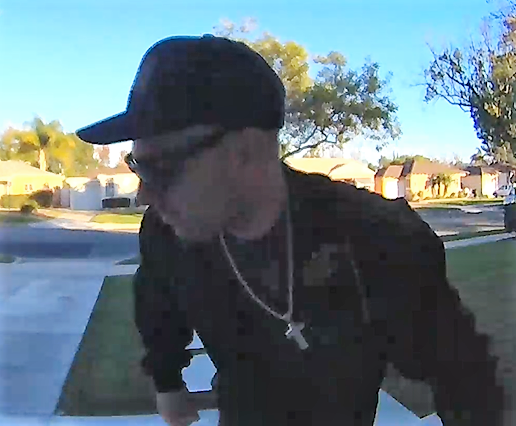 Burbank police are warning the public to be cautious during the holiday season for potential porch package thieves. 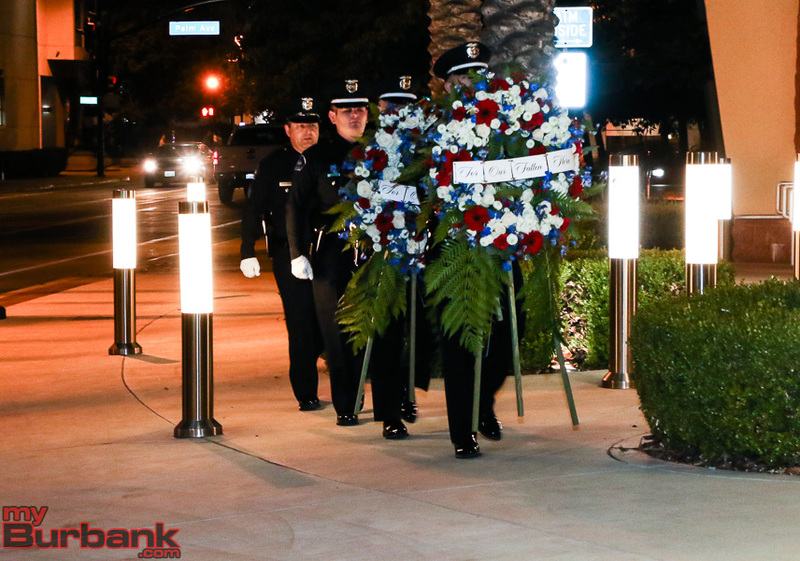 Photo Courtesy Burbank Police Dept. 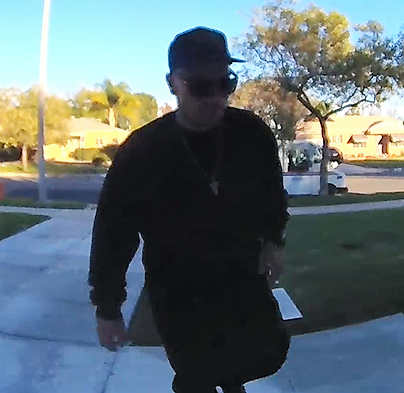 Police have just released a video (above) of a theft that occurred on December 7 from the 1800 block of N. Maple St. in Burbank around 3:30 pm. As you can see, the man came up to the porch and stole a package right after a mail carrier left it on the doorstep of the residence. Please are encouraging residents and package delivery companies to be observant of any suspicious activity this time of year. If you’re expecting a package, try to be home to accept it or make arrangements to have it delivered at a time when someone is home. Make sure you set up e-mail or text alerts upon delivery and consider having someone you trust accept the package on your behalf if you are unable to. You should also require a signature for packages, especially those which contain valuable items. If you routinely have packages delivered when you aren’t home, explore options for delivery lockers or postal mail boxes. If anyone witnesses what appears to be a package theft, do your best to obtain a suspect description and vehicle license plate number, if applicable. 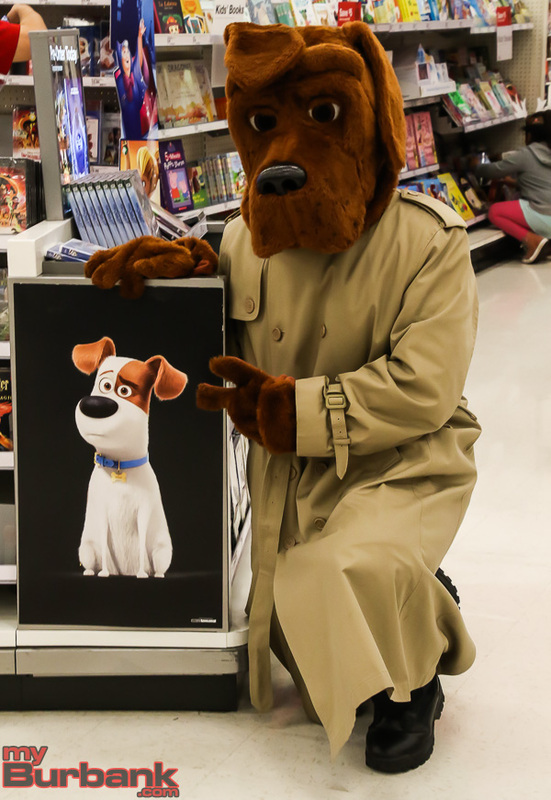 Report suspicious activity to your local law enforcement agency. This entry was posted in News, Police and tagged Burbank Police Department on December 14, 2018 by Craig Sherwood. 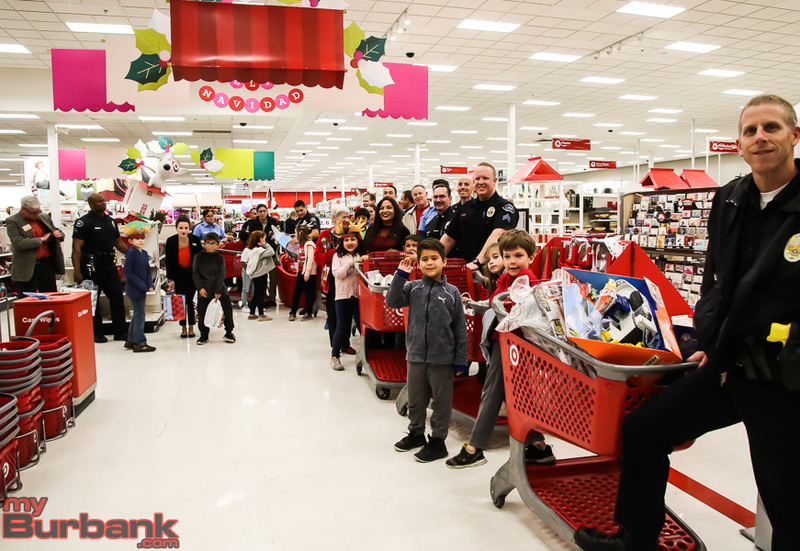 On December 12, 2018, the Burbank Police Department teamed-up with Target and the Boys and Girls Club of Burbank to help youth in-need purchase holiday gifts for their families in the annual “Heroes and Helpers” shopping event. 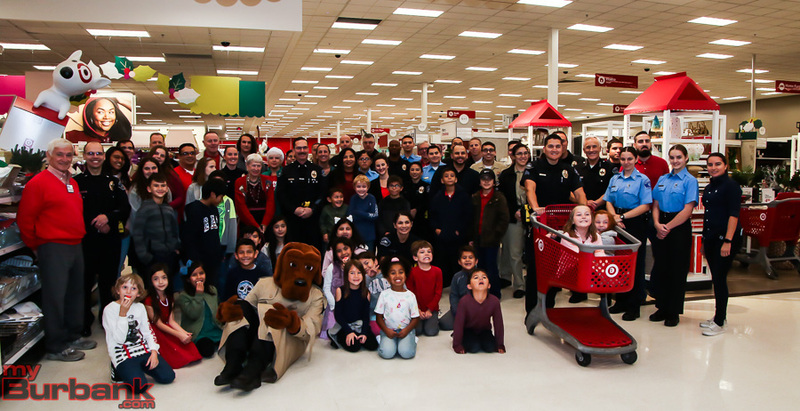 The “Heroes and Helpers” event was first launched in December of 1990. 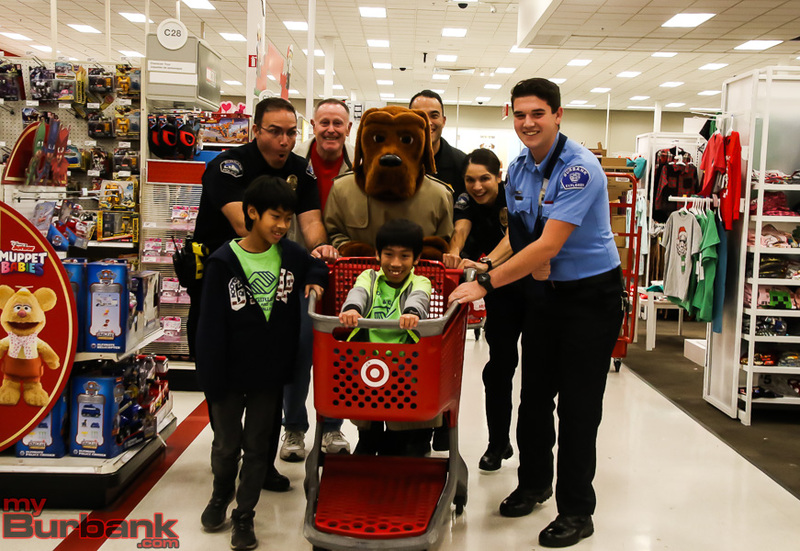 Since then, the Burbank Police Department has proudly participated each year as part of its commitment to the community and helping those who are less fortunate. 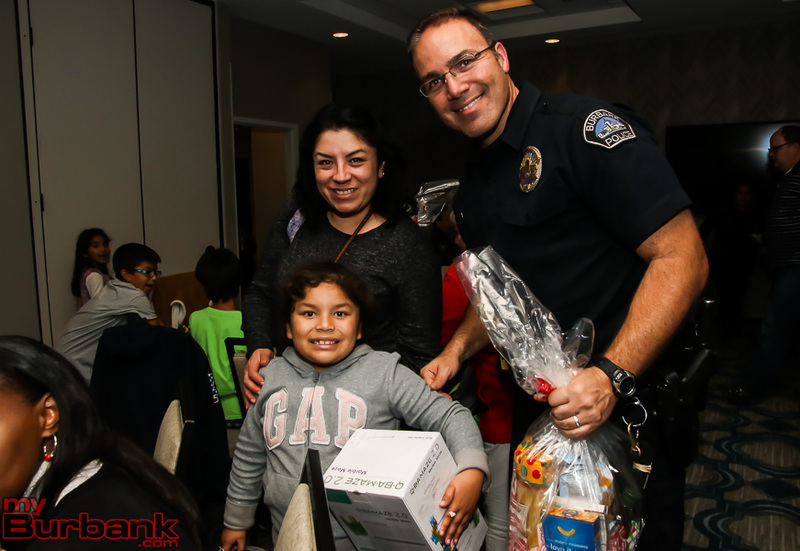 This year, Burbank Police are excited to announce that 30 children have been selected by the Boys and Girls Club of Burbank to take part in the event. The children were selected based on their family’s financial income and need. 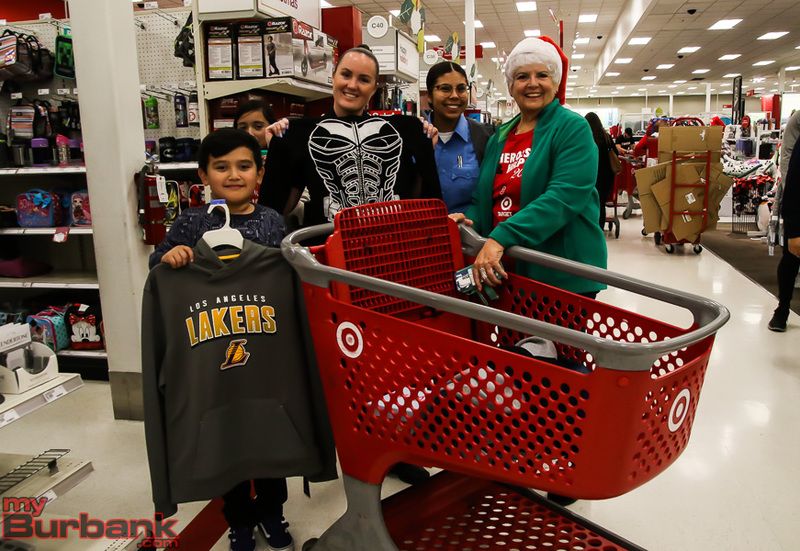 Each child was presented with a $200 gift card, sponsored by Target. 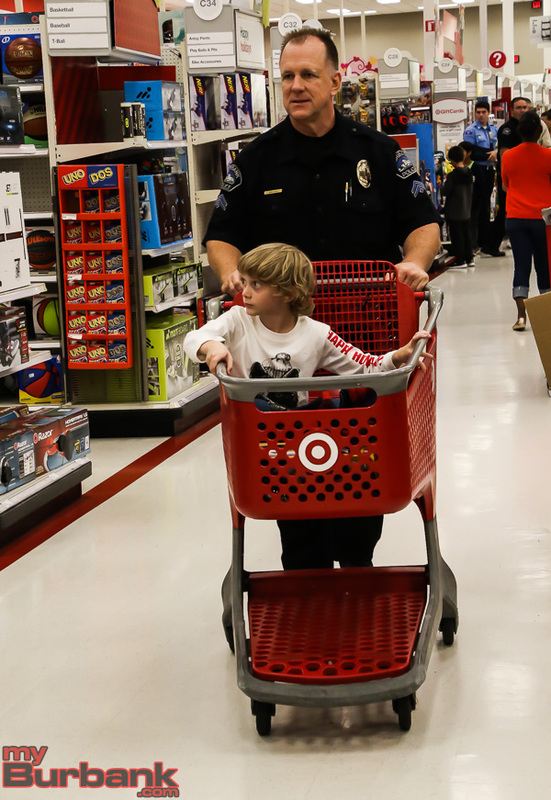 The children were then accompanied by police officers, cadets, and explorers as they shopped for holiday gifts for their families. 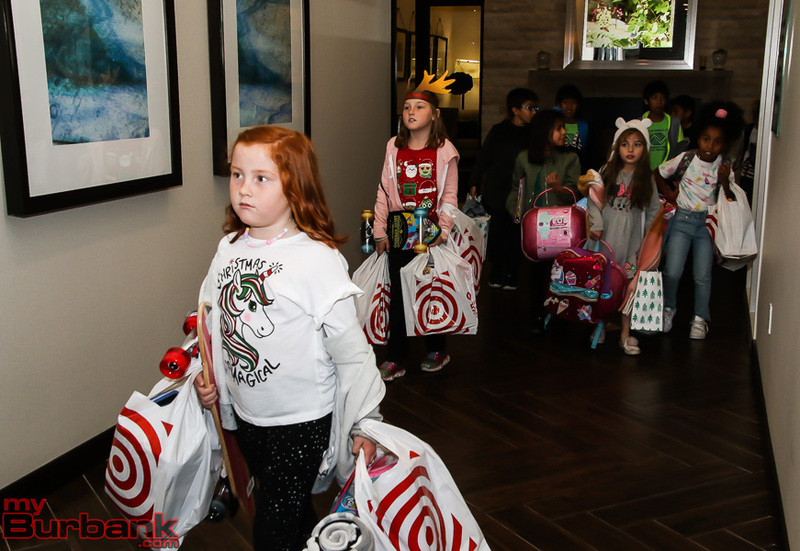 Once the children completed their purchases, they were served a delicious holiday meal, generously provided by the Hilton Garden Inn in Downtown Burbank, and dessert, compliments of Porto’s Bakery. 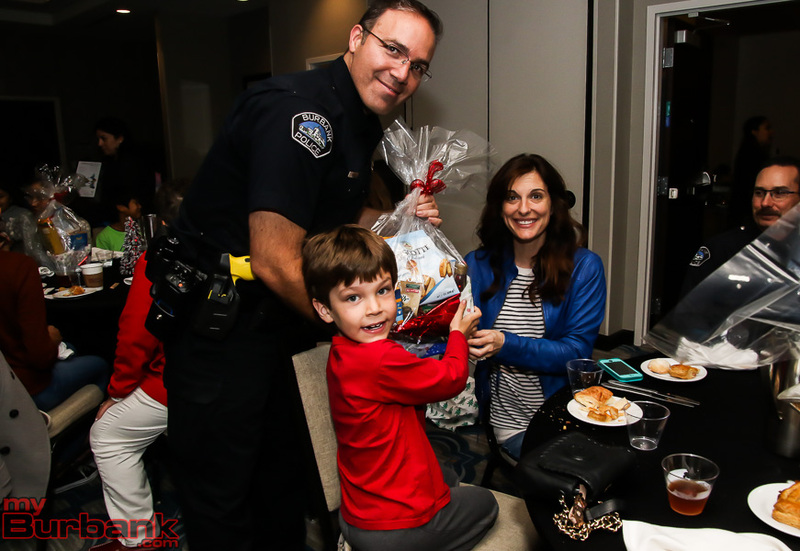 Children were also presented with holiday gift and food baskets, sponsored by The Kiwanis Club of Burbank, Noon Rotary Club of Burbank, Burbank Town Center, and community member Lisa Komorowski. 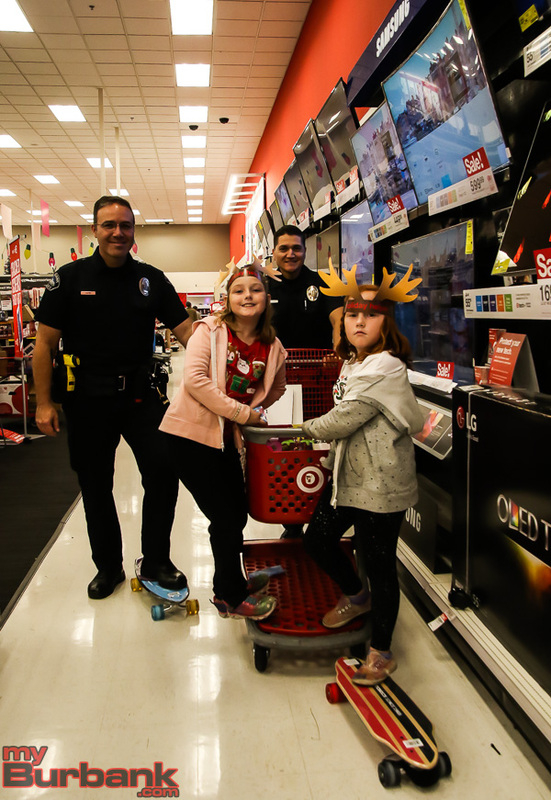 The goal of the “Heroes and Helpers” event is to provide less fortunate children with a friendly holiday experience they won’t soon forget. 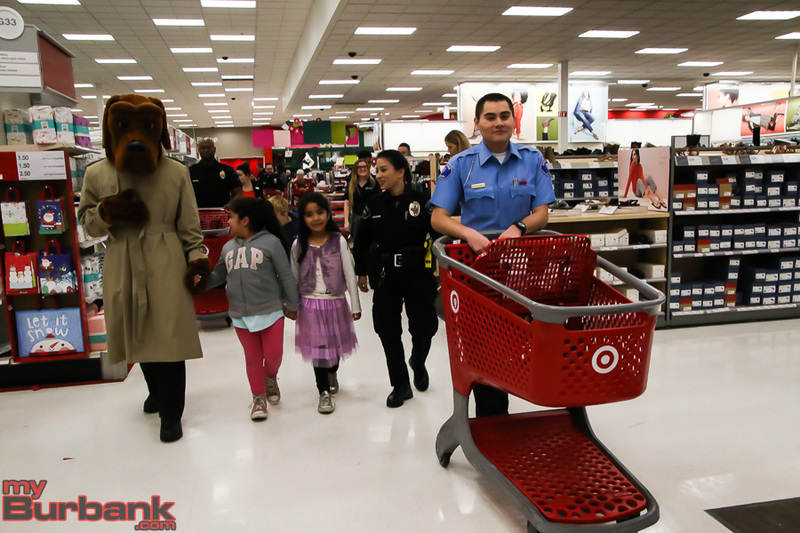 This entry was posted in Business, News, Police and tagged Burbank Police Department, Target on December 13, 2018 by Staff. 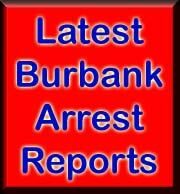 Press release from the Burbank Police Dept. 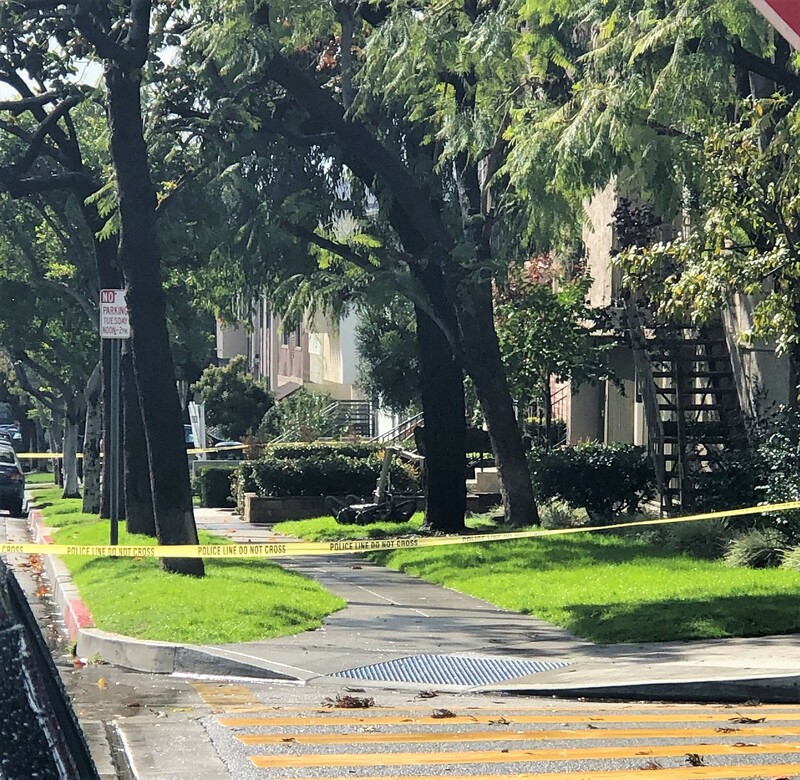 On November 29, 2018, at about 10:50 A.M., the Burbank Police Department responded to the 500 block of East Cedar Avenue in regards to a suspicious container found unattended near an apartment building. The container was an industrial-grade, rectangular, metal box commonly used to store ammunition. Burbank Police Officers arrived on-scene and saw what resembled computer circuitry inside the container. Due to the densely populated area, coupled with the suspicious circumstances, the surrounding neighborhood was cordoned off as a precaution. Several residential units were also evacuated in the interest of safety. Investigators from the Los Angeles County Sheriff’s Department Arson and Explosives Detail responded to the scene. Using a robot, investigators examined the container and determined it did not contain any explosive material. Just before 1:00 P.M., the surrounding area was re-opened to vehicular and pedestrian traffic and the affected residents were allowed to return home. The origins of the suspicious container and how it ended up where it was found is currently under investigation. 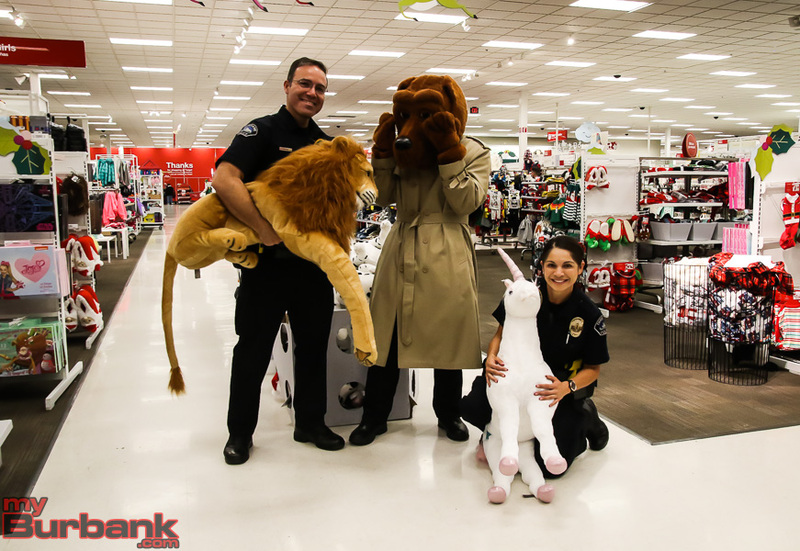 This entry was posted in News, Police and tagged Burbank Police Department on November 29, 2018 by Staff. Today marks the anniversary of BPD Fallen Officer Matthew Pavelka, End of Watch, November 15, 2003. 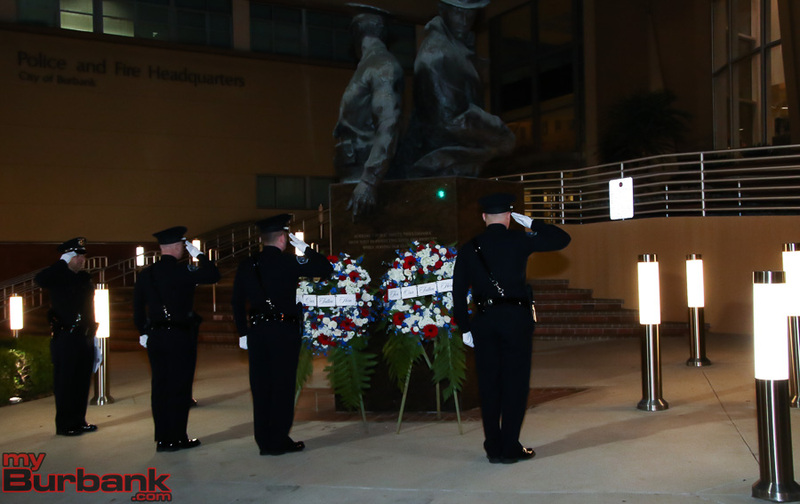 Matthew Pavelka was appointed as an officer for the City of Burbank on August 5, 2002. The first officer to respond was 26-year old Mathew Pavelka, who had been in the field as a police officer for just ten months. 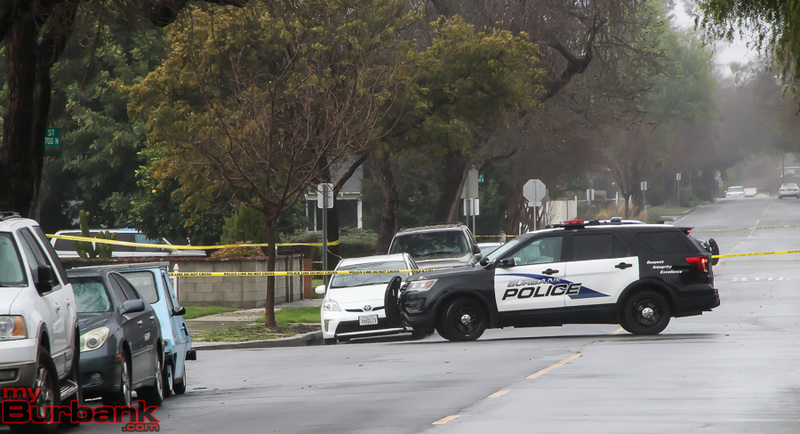 When Campbell and Pavelka approached the suspect vehicle and ordered the two male subjects to exit the vehicle, they both alighted firing automatic weapons. Both Campbell and Pavelka were wounded several times, but in the ensuing exchange of gunfire, the officers mortally wounded one of the gunmen. The other suspect escaped on foot. 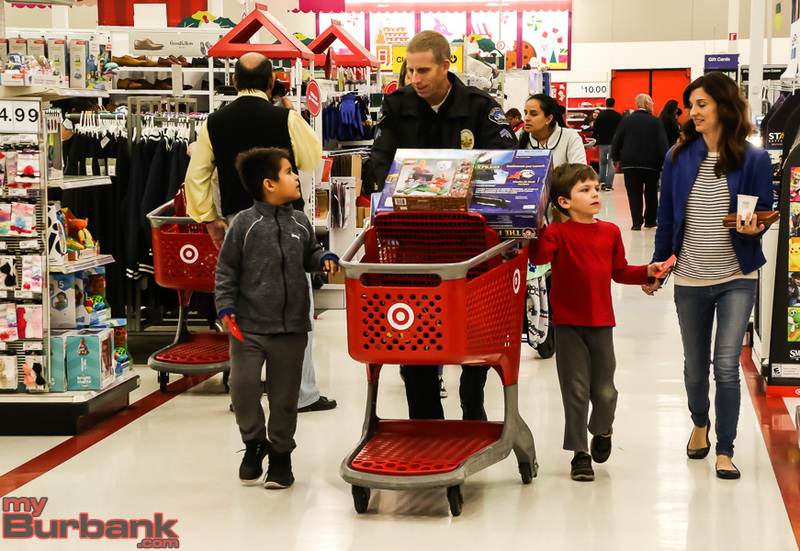 This entry was posted in News, Police and tagged Burbank Police Department, Matthew Pavelka on November 15, 2018 by Staff. Police received a call for the CVS at 1015 N. San Fernando at 5:35 am about a possible theft of beer that just occurred from the 24-hour store. Upon arrival, police found a man out front of the store who was not wearing any pants and was holding a glass bottle in his hand. According to Sergeant Derek Green, Public Information Officer of the Burbank Police Department, “Police Officers gave orders to the suspect several times to drop the bottle, but he refused. The suspect then broke the bottle, maintaining his grip on a large piece of glass. He then advanced on the officers while holding the glass. Despite repeated orders to stop, the suspect continued. He then began throwing pieces of glass towards the officers. 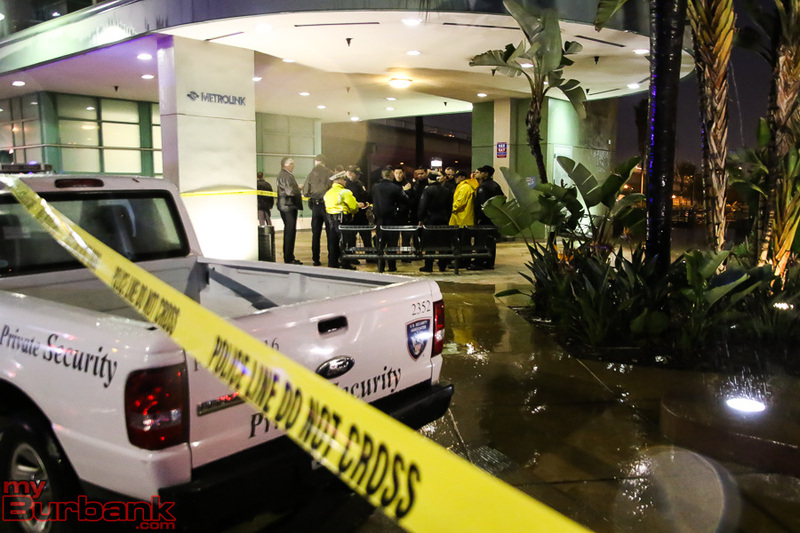 Green said that under Burbank Police protocol and procedures, the man, identified by police as 55-year-old Bryan Radford, was first transported to the hospital before being booked in the Burbank City Jail. According to Green, Radford, who lists himself as a transient from Burbank, was booked for brandishing a deadly weapon in a rude, angry, or threatening manner, in addition to resisting/obstructing a police officer and petty theft. Burbank’s City Attorney’s Office filed one count each of these charges against Radford on October 31 who remains in custody on $26,000 bail and is due in court November 19. 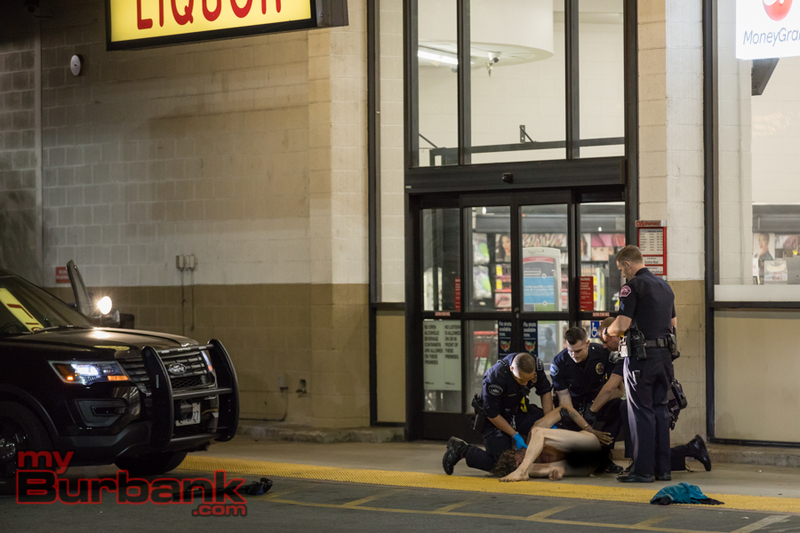 This entry was posted in News, Police and tagged arrest, Burbank Police Department, CVS on November 7, 2018 by Staff.